El otro gran edificio colonial del lugar es éste. 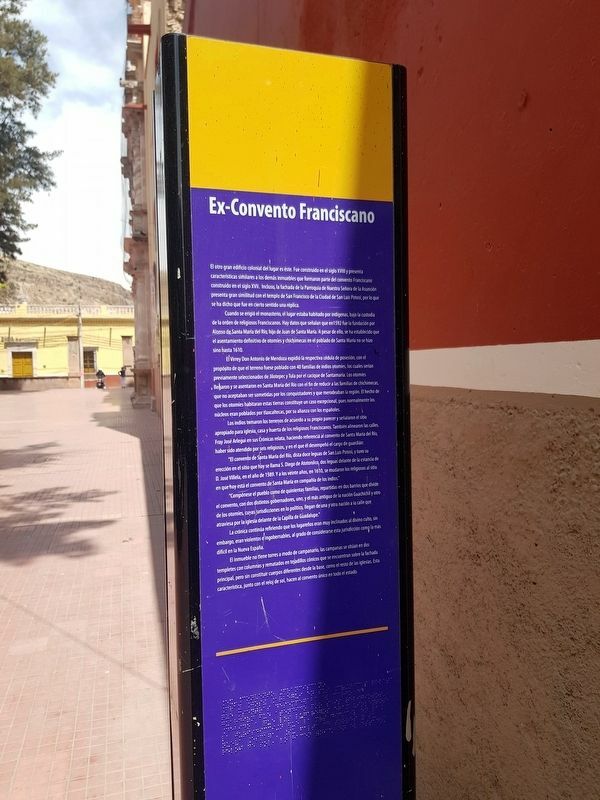 Fue construido en el siglo XVIII y presenta características similares a los demás inmuebles que formaron parte del convento Franciscano construido en el siglo XVII. Incluso, la fachada de la Parroquia de Nuestra Señora de la Asunción presenta gran similitud con el templo de San Francisco de la Ciudad de San Luis Potosí, por lo que se ha dicho que fue en cierto sentido una réplica. Cuando se erigió el monasterio, el lugar estaba habitado por indigenas, bajo la custodia de la orden de religiosos Franciscanos. Hay datos que señalan que en 1592 fue la fundación por Alonso de Santa María del Río, hijo de Juan de Santa María. A pesar de ello, se ha establecido que el asentamiento definitivo de otomíes y chichimecas en el poblado de Santa María no se hizo sino hasta 1610.
y se asentaron en Santa María del Río con el fin de reducir a las familias de chichimecas, que no aceptaban ser sometidas por los conquistadores y que merodeaban la región. El hecho de que los otomíes habitaran estas tierras constituye un caso excepcional, pues normalmente los núcleos eran poblados por tlaxcaltecas, por su alianza con los españoles. 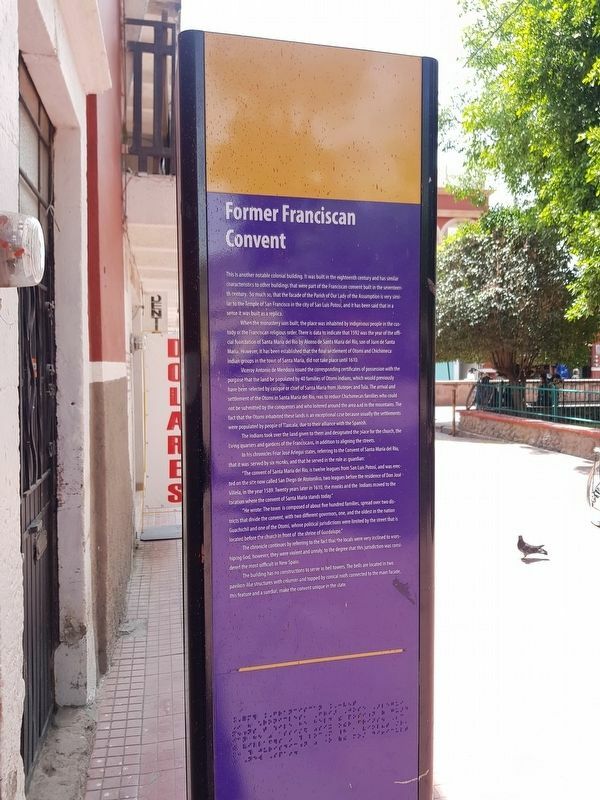 The marker can be seen here, to the right of the entrance to the Parish Church of Our Lady of the Assumption (Parroquia de Nuestra Señora de la Asunción). La crónica continúa refiriendo que los lugareños eran muy inclinados al divino culto, sin embargo, eran violentos e ingobernables, al grado de considerarse esta jurisdicción como la más difícil en la Nueva España. El inmueble no tiene torres a modo de campanario, las campanas se situán en dos templetes con columnas y rematados en tejadillos cónicos que se encuentran sobre la fachada principal, pero sin constituir cuerpos diferentes desde la base, como el resto de las iglesias. Esta característica, junto con el reloj de sol, hacen al convento único en todo el estada. This is another notable colonial building. It was built in the eighteenth century and has similar characteristics to other buildings that were part of the Franciscan convent built in the seventeenth century. 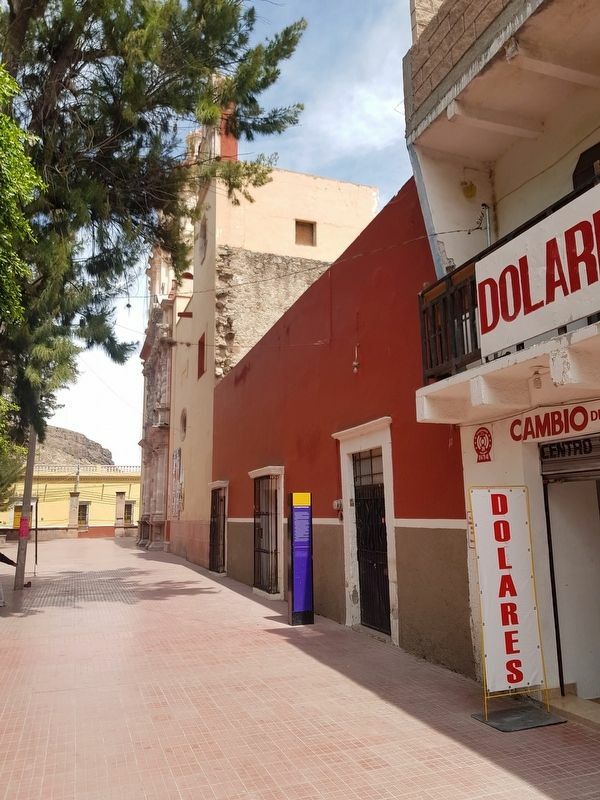 So much so, that the facade of the Parish of Our Lady of the Assumption is very similar to the Temple of San Francisco in the city of San Luis Potosí, and it has been said that in a sense it was built as a replica. When the monastery was built, the place was inhabited by indigenous people in the custody of the Franciscan religious order. There is data to indicate that 1592 was the year of the official foundation of Santa María del Río by Alonso de Santa María del Río, son of Juan de Santa María. However, it has been established that the final settlement of Otomí and Chichimeca indian groups in the town of Santa María, did not take place until 1610. Viceroy Antonio de Mendoza issued the corresponding certificates of possession with the purpose that the land be populated by 40 families of Otomi Indians, which would previously have been selected by cacique or chief of Santa María from Jilotepec and Tula. The arrival and settlement of the Otomi in Santa María del Río, was to reduce Chichimecas families who could not be submitted by the conquerors and who loitered around the area and in the mountains. The fact that the Otomi inhabited these lands is an exceptional case because usually the settlements were populated by people of Tlaxcala, due to their alliance with the Spanish. The Indians took over the land given to them and designated the place for the church, the living quarters and gardens of the Franciscans, in addition to aligning the streets. The chronicle continues by referring to the fact that the locals were very inclined to worshiping God, however, they were violent and unruly, to the degree that this jurisdiction was considered the most difficult in New Spain. The building has no constructions to serve as bell towers. The bells are located in two pavilion-like structures with columns and topped by conical roofs connected to the main façade, this feature and a sundial, make the convent unique in the state. Location. 21° 48′ N, 100° 44.167′ W. Marker is in Santa María del Río, San Luis Potosí, in Municipality of Santa María del Río. Touch for map. Touch for directions. Other nearby markers. At least 8 other markers are within walking distance of this marker. Parish of Our Lady of the Assumption (within shouting distance of this marker); Hidalgo Garden (within shouting distance of this marker); a different marker also named Parish of Our Lady of the Assumption (within shouting distance of this marker); Martín Bautista Square (within shouting distance of this marker); Santísimo Chapel (within shouting distance of this marker); Building of the Convents of Santa María del Río (within shouting distance of this marker); Dividing Line Between Otomíes and Guachichiles (about 90 meters away, measured in a direct line); Primo Feliciano Velázquez Rodríguez (about 90 meters away). Touch for a list and map of all markers in Santa María del Río. More. Search the internet for Former Franciscan Convent. Credits. This page was last revised on April 14, 2019. This page originally submitted on April 14, 2019, by J. Makali Bruton of Querétaro, Mexico. This page has been viewed 31 times since then. Photos: 1, 2, 3. submitted on April 14, 2019, by J. Makali Bruton of Querétaro, Mexico.